I had so hoped that when I was off last week that each night I would go to the living room and sew a few of my string blocks. That did not happen. It did not happen at all. My cleaning mood is still here and that kicked in instead….more on that in this coming Wednesday’s post. I did my first blocks on the treadle loving it and then mid sewing it hit me that the machine should be oiled ….then I realized I need to oil in the under carriage. I couldn’t loosen the screws and needed Hubby….figured I better put in a new needle and then all I had was problems. I’m sure you who have sewn on vintage machines understand. I had put in one kind of needle…only to have problem after problem with fraying thread. I ended up going upstairs and digging and digging until I found some Singer sewing machine needles and tried that. Finally I got up and going again. Can you believe that sucked up over an hour’s worth of sewing time. With things going like that, it was easy to ignore the machine and just do something else instead. I didn’t get back to it until Saturday. At that point I knew it would soon be time to clean up my mess and get back to normal work life…so I treadled like mad wanting to get as much done as I could before it was time to pack it all away. I have found that I really do enjoy treadling. Strings are the perfect thing for to practice with at this point. I know there would be an accuracy learning curve for me should I venture out and try something beyond treadling with strings. I was really intimidated by the shuttle bobbin at first but I’m getting over that. I sure wish I had more than one bobbin for the machine. Does anyone know where to get more from? Through the digging through strings I managed to get 13 more string block done. Here they are…unpressed…untrimmed but sewn. When I first thought I would make these blocks I thought it would be BIG challenge to make them on the treadle. Now I think that’s kind of funny as with practice, treadling has become no big deal! I am happy I can have it in the living room and use my embroidery light as I work. You can find me back here next week. I don’t know if I’ll be treadling as I have to put it all away. I’m trying to come up with a bit of a plan that makes it easier to set it all up more quickly. This entry was posted in String Challenge, Uncategorized on April 16, 2018 by Jo. Jo, eBay has them also. The singer needle has a different shaft for the thread to follow. They are available at WalMart. Hi, Jo! 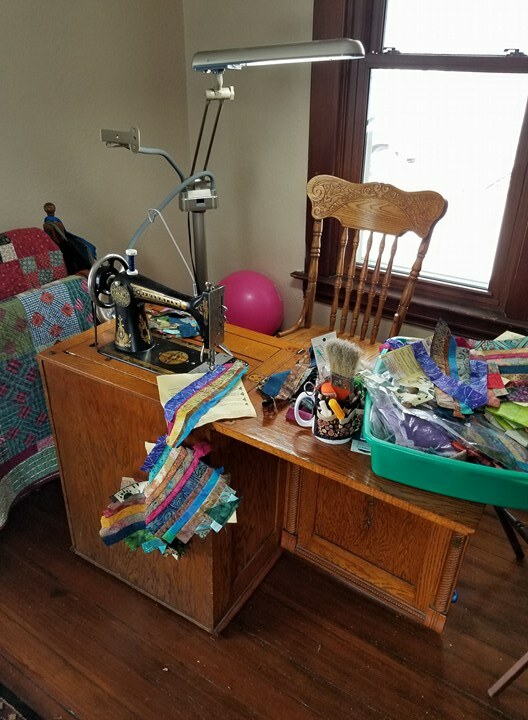 So glad to see a great old treadle up and running! I agree with Joey, Cindy Peters is a great resource for all of us who sew on older machines. There are new bobbins being made, but they are definitely not as good as the old ones. Amazon and Walmart sell shuttle bobbins for some Singer machines. There are sometimes shuttles offered for sale on the vintage machines Facebook page, but Cindy is a great resource! The only project that’s getting any time around here is the Samper UFO. For some reason, I’m doing cross-stitch this week! And EPP hexis. Singer also has vintage bobbins available on their web site. I found them while looking for parts for my Grandma’s 1927 treadle. Fortunately, she still had five with the machine. Still haven’t got it up and running though. Waiting for my husband to oil parts, polish metal, refurbish the cabinet, and replace the belt. Jo, do you have any pointers on how to treadle? I have one just waiting for me to get brave enough to try it.